This is further to my earlier post on the above subject-matter. Tally Accounting Software allows you to maintain "Multiple Price levels". This feature is useful in situations wherein you have different types of Customers like "Wholesale Customers", "Retail customers", "Export Customers" etc. Using the "Multiple Price Levels" feature you can assign different prices (or discounts) to different types of Customers. UDIMagic allows you to Import "Multiple Price Levels" data into Tally. Here's a detailed writeup on how you can import "Multiple Price Levels (Price List)" data into Tally Software along with sample Excel sheet and XML tags. XML tags <SVCURRENTCOMPANY> not found. The aforesaid generally occurs when you have NOT specified the UDIMagic TCP file in your Tally.ini file. Open the Tally.ini (which is there in Tally folder) and add the following lines depending upon Tally version you are using. 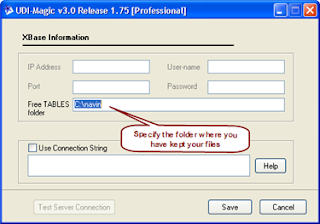 1) Ensure that the UDIMagic TCP file exists in your Tally folder. 2) The aforesaid UDIMagic TCP files get copied into "c:\udi-magic" folder when you install the UDIMagic software. "Parameter has no default value"
The above error generally errors when incorrect field-name is specified in the SQL-SELECT statement. 1) Check (and rectify) the field-name(s) specified in the SQL-SELECT statement.